Vinita – The Federal Energy Regulatory Commission’s (FERC) recent approval of a Grand River Dam Authority request means Grand Lake will be maintained at a higher elevation over the upcoming Labor Day holiday. 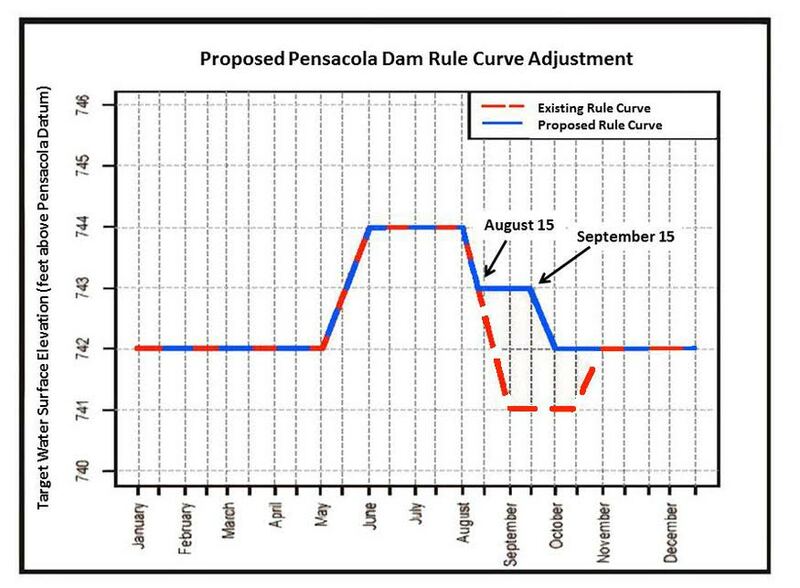 On Friday, August 14, FERC approved the GRDA request to deviate from the “normal” elevation for Grand Lake, as mandated by GRDA’s license, issued by FERC, to operate the Pensacola Dam. That normal rule curve requires the lake to be lowered to 741 feet in mid-August, and held there through mid-October. However, with FERC’s approval, Grand will only go to 743 feet through mid-September before dropping to 742 feet for the fall and winter months. In past years, the lower 741 feet elevation over the Labor Day holiday and remainder of the peak recreation season on the lake, has caused problems for boaters, dock owners and marinas. In its request, GRDA stressed the safety problems caused by the lower elevation, as well as the negative impact on the area economy Labor Day weekend. In the early 1990s, the mid-August drawdown was done to facilitate a millet seeding program around the shores of the lake. However that program has never achieved its intended goals and, in some years, was not even completed, although the drawdown was still required. The timeline on the GRDA request began on May 29, when the Authority initially asked FERC for the variance. On June 26, that request was denied by FERC, however on July 30 GRDA asked for reconsideration and submitted more information to support the variance. “We are very pleased with FERC’s approval of our variance request for Grand Lake for the remainder of the summer. We are appreciative of the fact that FERC quickly acted to evaluate our supplemental information filed on July 30th,” said GRDA Chief Executive Officer Dan Sullivan, adding that support from lake area constituents and Oklahoma’s elected officials was also key. “We are grateful for the leadership of Senator Inhofe in elevating the importance of this issue along with Governor Mary Fallin, Senator Lankford and Congressman Markwayne Mullin,” he said. While this variance will be in place for the remainder of the 2015 boating season, Sullivan said GRDA is still working towards a permanent plan to address these issues, year after year. “GRDA continues to seek a long-term solution to the lake level issue which would give us more operational control over the lake, while balancing all of the other stakeholder concerns of hydroelectric generation, flood control and recreation,” he said. Photo Above – This is an illustration of the Grand Lake “proposed rule curve” variance GRDA submitted to the Federal Energy Regulatory Commission (FERC). On Friday, August 14, FERC approved the proposed rule curve (blue line) for the remainder of 2015. The lake will be lowered to 743 feet through mid-September before dropping to 742 feet for the fall and winter months. NextBoating Tips – Do You Have The Correct Scope?